I want to follow up on the post on “Shape in Writing” with a related subject, which is density in writing. It’s all related, isn’t it, but the point about density is that it too has to do with knowing what you’re writing “about,” which I hammered on (I admit it) in the “Shape” article. 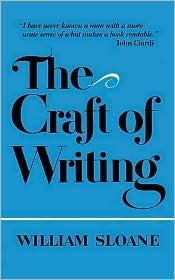 The best wisdom I know on this matter is in William Sloane’s The Craft of Writing, which is one of my main Bibles on writing. My copy is so dog-eared and underlined that it is falling apart. There is a ton of good stuff in it, about fiction writing mainly, but a lot applies to any kind of narrative writing. My favorite chapter is called “On Knowing Your Material.” Could I just quote the whole thing here? I guess not. I’ll give you some highlights. “A vital aspect of the fiction-writing process, and most surely of all creative writing processes, is the matter of density. By density I mean richness, substance. It is the core of knowing your materials. “Density is one of the most difficult aspects of fiction [or memoir] to discuss because it is not a separate element like plot or even characterization. Rather it is a part of everything else. Real density is achieved when the optimum number of things is going on at once, some of them overtly, others by implication. But that’s just it, isn’t it. That’s what good writing is! This is where voice comes in, because finding the right voice, the voice that will let you tell the story you want to tell, the voice that knows the material inside and out, is what melds it all together and creates density. One thing I try to do in writing is make the sentences do more than one thing. I don’t want to write sentences that only do one thing because they won’t have density. Okay, to me this encapsulates to some extent the whole book, which is about the crisis of getting to be thirty-nine, not having children, and wanting to be a writer. I don’t get to the writer part yet, but I do at least establish the main problem, which is my age and interest, if not obsession (okay, obsession). The two sentences give a lot of information: the year, the setting, both of the scene (DQ) and the overall place (Minneapolis), my age (crucial, relevant, not a random detail), and where my attention is, on mothers and children (the crux of the matter). I also hope it begins to establish a voice, a persona, and has some tone, but maybe that takes a little longer to establish. I hope there is the sense that the person writing this, not just living through it, knows her material, knows what she is writing ABOUT. I don’t want to hold myself out as being any kind of brilliant writer here. But I will tell you that I worked on the opening paragraphs, not to mention the first chapter, through an embarrassing number of drafts, to try to load things in and establish a voice, a persona, a tone that contained an overall sense of the material. I can also tell you that many of my discarded first sentences read one-dimensionally, such as “I am thirty-nine and ambivalent about having a child.” I kid you not. Stuff like that, as I cast about for the voice and how to launch both the situation AND the story. For me this can only happen when you struggle through many drafts, various failed attempts, trying out different openings and whole drafts as your mind, often unconsciously, valiantly tries to make a cohesive whole out of a lot of mess. And ultimately…here I go…I had to know at some level what I was writing ABOUT – not just the situation, but the story (Gornick’s terms). The situation was being thirty-nine, conflicted about having children because I thought it would keep me from being a writer, and trying to decide whether to try to get pregnant (in a nutshell); the STORY was – as Gornick says of all memoir—one of self-identity and self-discovery. The overarching question was “How did I get to be thirty-nine and not have a child?” I had to go back in time to answer that even as I progressed through the present to try to imagine who I would be in the future depending on the choices I made. Self-identity and self-discovery. “When it comes to your own writing, the quality of density will take time to achieve. I believe that it is most likely to result from a lot of prewriting rumination. Telling the novel over, piecemeal, in your mind. Rubbing one part against another until the foreground section has been ‘tumbled’ against the other sections…. Wonderful and wise, Paulette. I agree with everything he, and you, say–and can only agree it is a function of time and a lot of work, which produces the discovery out of which density seems to spring. Then, in my case at least, lots of cutting away–very hard for me, but very necessary.